Every dog deserves a healthy mouth. Dogs live life through their mouth, so keeping their teeth & gums healthy is critical for them. The specially designed texture of our products help to support cleaning their teeth. Every dog deserves a healthy tummy. Our products contain natural fibres that contribute to a healthy digestion, and high quality protein that is gentle on your dog's stomach. Every dog deserves to look and feel healthy. Our recipes contain zinc and sunflower oil, a natural source of omega 6, that will help nourish your dog's skin and coat. Every dog deserves strong natural defences. Our recipes contain vitamin E and minerals that are key to help support strong natural defences. 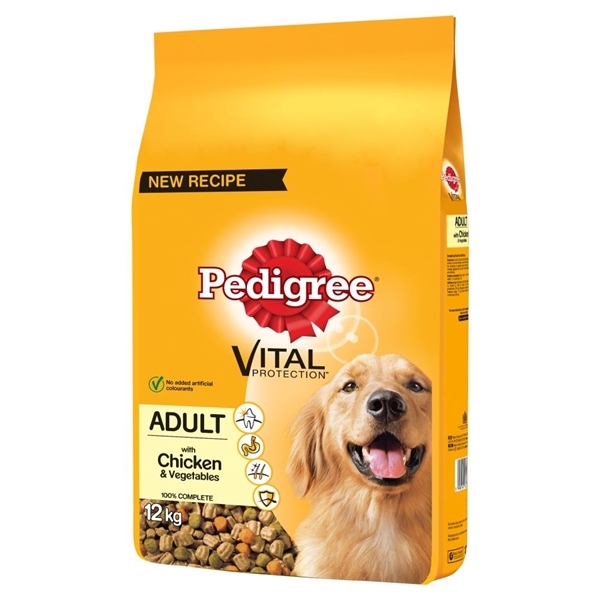 100% complete and balanced, Pedigree Vital Protection is a tasty and nutritious Dry dog food perfect for everyday meals. Developed with the help of vets and nutritionists at Waltham Centre for Pet Nutrition, Pedigree dry dog food has all the essential nutrients to support optimal digestion, a healthy skin and coat, a strong natural defenses and good dental care. The special texture of the kibbles helps clean and support healthy teeth in adult dogs and is ideal to complement a daily oral care routine.